Last time we met at Belong I spoke about overcoming weird times in friendship. Vulnerably, I shared some humbling ways the Lord needed to teach me about being a good friend. I trust I’m not the only who’s ever thought they were a bad friend. While on my quest to find the perfect friend, Jesus broke through with such strength and light. What I was most surprised by was how making Jesus my perfect friend would affect all my other friendships! Some of the problems that plagued my friendship attitudes were brought out into the light as Jesus gently guided me into a deeper relationship with Him. Enough – No matter what they do, does it seem like it’s never enough? They weren’t warm enough, they weren’t open enough, giving enough, friendly enough, concerned enough or happy-to-see-you enough. It could be that you have been coming to your friends to satisfy a part of you that only Jesus can. When we expect our friends to be our enough they will always be such a disappointment to us. But when you come to Jesus and open your heart to let Him fill you full of His love, He is more than enough. John 4:14 …whoever drinks the water I give him will never thirst. Indeed, the water I give him will become in him a spring of water welling up to eternal life. Have you also experienced a “never enough” time in your friendships? Are you ready to expect more out of Jesus? 2 Corinthians 5:15 And he died for all, that those who live should no longer live for themselves but for him who died for them and was raised again. In what ways have you seen a self-centered attitude at work in your friendships? What will you do to conquer selfishness in your friendships? Deeper – Are wondering why your friendships seem shallow and unsatisfying. You could be surrounded by friends, but you still feel very lonely and unsatisfied. There are many barriers that keep us from having a deep bond with people. Mostly it is because we want to protect ourselves. To go deeper means to open yourself up. To be vulnerable. Allow others to see the real you can be scary. What if they reject me?! Or see me as incompetent?! What if they confirm my suspicion that I am as weird as I think I am and they go running the opposite direction! It can be scary to open up to friends especially if you’ve had a rough experience with it in the past. Being open and vulnerable with Jesus is not an option. He really won’t have it any other way. Even when we try to hide parts of ourselves from him he has a way of drawing us out, like only He can. You need to understand that while people are capable of letting us down when we make ourselves vulnerable, Jesus will not. He is the safest Person you could ever take emotional risks with. Something amazing happens when we are real and trusting with Jesus. He sends us out into the world armed with such confidence and security. We go into our friendships with genuine love, knowing that we are ALREADY accepted and it completely transforms the relationship. Now I can easily show my vulnerabilities with friends because I know that even when a friend denies me the acceptance I would hope for, I am not destroyed. I am firmly planted on the Rock of Salvation far from the fickle sand of the human heart and safe from the pit of self-pity. So what if your relationship with Jesus seems shallow and unsatisfying? Happens to me all the time. Mostly because I ignore Him, don’t make time for him and then withdrawal from Him because I feel bad. It’s so sad. But I have never regretted coming to Him and acknowledging the awkwardness of being out of touch. It can feel forced at first, to come to Him when it’s been a while. But the feelings are all self-induced. Jesus welcomes me and never condemns me. Like a good friend, he simply wants to pick up where we left off. The sooner I get over myself and my failures, the sooner He can pour into my spirit again. I pick up my dusty bible and hold it close. I open my hymnal to my favorite verses. I confess. I cry. I read His words. I hear his love for me. And he makes me new. He makes me strong, firm and secure. Why do you pull away when He reaches out? Why do you recoil? Because if you believe that Jesus died on the cross then you believe that the shame you feel is the reason He died. He accepts you, all your mess. He is perfect so you don’t have to be. Life apart from Him is no life at all. What is keeping you from coming closer to Jesus? What will you do today to open yourself to Him? This is a great time to find a friend who can answer your questions about Jesus. My name was not in there. The magazine I started was growing faster than I expected, and shortly before moving to Nebraska, I had our second child and I was attempting to hold it all together: stay at home mom and business owner. What I didn’t realize is that the business I owned gave me an identity that I loved and perhaps started to idolize. Fast forward through a messy year of selling my business. As the dust began to settle I didn’t expect what would happened next. A major identity crisis, loneliness, and depression. I regretted giving up the business I was so very proud of. But I knew God was working something out in me, I just didn’t know what. It was later that year that felt the nudge to pursue my love of writing and teaching. Maybe this was the “next thing” that God was hinting towards. So what does a woman do when she wants to speak and write? Well, she attends a conference for speakers and writers right? So I took the plunge and signed up for one of the biggest speaking and writing conferences in the country. Being in a room with 50 women makes me really nervous let alone 800 women and famous people. The anxiety started to set in as I had no clue how the world would hear my message when there are like millions of women who also have a message. But I stuck around. I wanted to learn some things. And I had gotten two appointments with some prominent publishers. And I actually had a book idea. The nerves were killing me as I walked up to my first appointment. A stern woman scolded me for showing up early and told me I’d have to come back in 15 minutes. So I went to the prayer room. There was incense burning and a prayer monitor woman sitting in the corner and the lighting was dim. I just went straight over to the names. This would keep me busy, searching for my name among hundreds of names. So I searched… and I searched. I saw names I recognized of the people speaking and teaching and even the publisher’s names. One problem. My name wasn’t in there. I looked again across the three long tables with hundreds of names and the many names of God. I moved confetti and candles and incense around. “You see I am INVISIBLE!” I shouted and quickly got out of the Prayer Room Prison and proceeded to my publishers meeting… which I bombed. She kindly thanked me for my book idea and told me that she liked it, however it needed some more thought. “Come back to me in a year when you’ve started a blog on the subject and have your ideas a little more planned out.” I thanked her and left. I just bombed a publishers meeting. This was one of my biggest fears. I just needed her to see me as an author, as someone capable of writing a book, and I sabotaged it with my nerves. I couldn’t get out what I really wanted to. Hold the phone, I just lived through one of my biggest fears. I braved some ultimate failure! Something started to shift in me. I had one more publishers meeting coming up and I was not going to let myself feel like a victim. So what if I was invisible? So what if nobody here knows me or knows what I am capable of! I don’t really want to care about their opinions. I’m not doing this for them. I’m doing this for God. It was in that moment, I suddenly didn’t care if a publisher liked my book idea or if they liked me. It didn’t matter because I was on God’s plan and His timing. If it’s time for a publisher to notice me, He’ll make it happen. And He can make that happen with or without this conference. I continued to pray for all those names until I got to the last sheet of paper. And there it was –my name! After all of this, there it was. And do you know what name of God it was under? Which is the God who SEES you! It was a remarkable feeling. It was a greater feeling, than a publisher noticing me. I try to remember that feeling on days like today when I’m sitting at home feeling invisible. I feel invisible a lot. But I know I shouldn’t. I know my husband loves me. And my kids think I’m pretty cool. I know I have some friends. I think the dog really appreciates me. But I can’t help this feeling of invisible from seeping into this ordinary mundane life I seem to live. We were created with a desire to be noticed. In fact if we look into many of our deepest desires we would find that it points to the way we were created. The world tries to fulfill this desire in our hearts but will always ultimately fail. It’s a deep pit that only God can manage to fill. I hope I can have a chance to me you, the reader of this post, someday and encourage you and tell you all the ways God has made you special and how un-invisible you are! Take care, friend! Julie and her husband Josh have been on many adventures in ministry. They have three kids. Julie is a gifted bible teacher, writer, speaker and entrepreneur. This reminds me of a desert time for a young woman, Hagar. Her desperate story is told in Genesis 16:1-15. It almost ended very badly for her… but The Lord saw her. Sarah and Abraham were never able to conceive. They are well past their prime and even so God had promised them a child, their very own – from them. As time went on they began to doubt the promise and took matters into their own hands. Sarah had a young Egyptian maidservant, Hagar. Sarah suggested that Abraham conceive a child with Hagar. And it was so. (Now ladies, of course you and I can obviously see that this would be a bad idea. Often our desperation can lead us to do the most regrettable things.) Soon Sarah experiences the full force of her regret as jealousy sets in and these two women begin to despise one another. Hagar flaunted her pregnancy and Sarah made life difficult for Hagar. It got bad. Sarah complained to Abraham but he was not much help. “Do with her whatever you think best. (Genesis 16:6)” he said, essentially –she’s your problem (I have a feeling this will not turn out well for Hagar). Her poor actions had inclined Sarah’s severe treatment. Women can be so cruel to each other. I can just see them getting their digs in, preying upon the insecurities of the other. Us ladies know how to get her where it hurts. These women made life miserable for each other. I’m sure the rest of the house was miserable too. It gets so bad that Hagar’s fight turned to flight and she runs, choosing the scorching heat of the desert over the unbearable conflict. She cries as she walks. Her heart is crushed. Her mind is anxious. Her hormones have her wound up and she just keeps putting as much distance as possible between her and the pain. All she can see is her pain. Go back?! Submit?! An impossible task for a young woman whose pride has led her out here with only a burned bridge behind her. But God reassures her. He acknowledges her child and her misery and He lifts her downcast face to rise and see the future that awaits her. Her and her son. She has been seen. (Genesis 16:10-12) God saw her broken heart and saw her future. With this divine assurance, she stands. And turns toward home. Eyes focused. She walks with purpose. God has spoken to her. Her son will live and grow to be a man. A steady peace and calm covers this reckless girl. Her anxious mind that was once so narrowly focused on her present injustice has now been given a view from a much higher place. And just there, on the horizon, she sees that this troubling time will pass. Confident that she has not and never will escape God’s watchfulness, she knows she’ll be alright. This is all the assurance she needs to overcome all of her trials. According to Psalm 34:18, where is God when we are hurting? We are so vulnerable when we go through desert times. Without support God can seem so far off; so detached from our pain and loneliness. Invisible woman, you need to know that God does see you. In fact, according to Psalm 34:18 He pays special attention to those who are hurting. Did you ever consider that this season in the desert was designed by God to prompt you to come to Him? That possibly He has something special for you if only you would go to Him for comfort instead of another source? (In my lonely times God sees me not by a well in the desert, but when Netflix stops my show to ask if I’m still watching. Sadly I am. What a wonderful distraction from the burdens of life and alone-ness, insert eye-roll here.) Where does God see you? If you’ve been hurt from being left out and unnoticed has there been a temptation to not even try to connect with others again? Has self-preservation become your only comfort? Don’t linger too long in the shadows. It’s time to come out into the light. El Roi, I believe that you see me. I believe that you see what is ahead of me and that you will use what is behind me. Lord, You are invisible and go unnoticed by so many of Your creation yet you do not give up on us. You are so patient with us. Your watchfulness has been my strength and comfort through every trial. I am never alone. You have our attention now, Lord. Forgive us for ignoring You as we feel sorry for ourselves. Here and now we lay down our pride and we turn humbly to You, seeking Your comfort and council. Amen. “I’m good, things are good”, she smiles and answers plainly. Satisfied with her “I’m good” answer they walk away, they’ve done their part. Our Invisible Woman doesn’t have a special person like that young lady over there with a mentor friend who not only asks, but also invests in and checks in on that young woman. Invisible Woman thinks to herself, “Maybe it’s her mom or something. I wish I had someone like that.” It is so sad how much the Invisible Woman notices that no one to notices her. Could this be you today? Lonely and unnoticed. Before I was a mom I had a really great career in Human Resources. I was recognized and praised and it felt so good. Even so, it was not hard for me to leave my satisfying job to care for my baby boy when he arrived. Baby-raising is intense and good and sweet. I was so busy being vigilant about my boy and soon after, my baby girl, that I didn’t even notice that I was going unnoticed. I was too focused on my babies and potty training. But soon my babies began to grow into kids. Then my kids both went off to school. That’s when I realized how unnoticed I was. For the stay at home mom, it is very lonely. There is not a team of people around you to say, “Great job! We know we can always count on you!” At jobs you even get recognized for years of service. So hey mom, when was the last time you were noticed and recognized for your accomplishments? Hopefully it was on Mother’s Day. My heart yearns for you to be built up more than once a year. In a world where you can connect with hundreds of people on Facebook and Twitter and Instagram and Tumbler, we are still so hungry for a deeper connection that somehow Facebook cannot offer. Our hearts cry out, “Notice me! See me! Like me! Get to know me!” Maybe you’ve seen some attention seeking behavior on social media that made you want to roll your eyes and ask them how old they were. Sometimes we just feel needy. Is that bad? Is it a weakness to be in need of encouragement? It is a bad idea to depend on Facebook “likes” and Twitter “favorites” as a measure of how liked and noticed we are because many of us would draw a dangerous conclusion that we are not worth much at all. This is not about being the center of attention, the center of the universe, or having the world revolve around us. This is not narcissism. This is about a desperate need for sincere community. For women who cannot count on work friends, church friends, close family or neighbors they need to know they are not invisible and they do belong. I recall a time when three weeks went by without a call or email or text from anyone. During that time I tried reaching out. Friends and family were too busy to get together or it was just inconvenient. It was a lonely time that drew me to my knees in tears. We were made to connect with people. I would say that if you are in tears because you haven’t been able to connect, that makes you very normal. I have often thought that the best cure for this was to be what you wish you could get from others – a kind of give-to-get mentality. You want people to take an interest in your life? –then show interest in theirs. You want others to remember you and notice you? –then remember them and notice them. Sometimes this works, but it takes time. And sometimes it never comes back. You find yourself being the interested encourager in others and no one is interested in encouraging you. From this well-meaning yet flawed approach we see our need for an alternate source of deep love in our life. Jesus is the only Person that will not let you down in the care and concern department. How awesome it is to feel His love and strength welling up inside so that even when no one loves back I can still extend genuine life-giving love. Whether its to my husband, sister, brother or friend, I can only love them if I have the love of God flowing from me -God’s kind, patient and not self-seeking love. Something amazing happens when you open your heart to receive His love. It is a fountain. The love flows one direction from an eternal source. A fountain does not expect or even conceive of ever seeing anything make its way back up. A fountain just wants the water to flow out. It is this kind of love that helps you dial your phone when it hasn’t rung or send a text when you haven’t received one. This love helps you press the send button while your inbox remains empty. Lord help us to love like this even when we feel invisible. Please remind us how valuable we are to You. I pray that we would wake up everyday seeking You to find our value and place in this world so that we can share it with others who feel invisible. What do you think about neediness? Do you think it is a weakness or personality flaw? When have you felt invisible? Older women – What advice or encouragement would you give to an invisible mom? Did you ever stop and think that you could be the noticer that a lonely mom needs? Tell God you are ready for Him to use you to reach out to a lonely mom today. Show His interest in your eyes and His care in your words. If you are lonely, please don’t stop trying to connect. Send that email, send that text and make that call. I have so much more I’d like to give you today but fear it would exhaust the proper length of a blog post! We will continue this Invisible Woman topic tomorrow as we learn about God: El Roi, the God who sees. Such comfort for The Invisible Woman! We like to be the informant of people’s life events, some of which are private. At the heart of this mess of gossip is a prideful arrogance and desperate need of importance. I confess to feeling the rush of being part of the gossip. Being “in the know” feels good. I have felt like one of the cool girls in an inner circle of social knowledge. I have also been consumed by these experiences too. If you were ever wondering where you can find drama’s address, it’s here on Gossip St. Who knows what, who said what exactly and how did it get twisted. Whose feelings are hurt and who is the jerk. At this age I can still feel left out if I wasn’t invited or told or included but many times I see that all I missed out on was a lot of drama and nonsense. This is real ladies and I pray that you and me can recognize this tendency in our relationships and commit to start finding our ego strength in the God who made us uniquely important for His own special purposes. 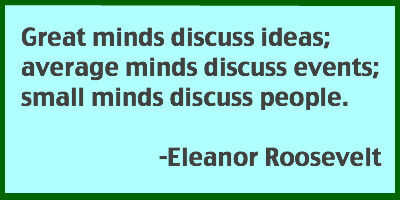 I’ve witnessed families and friendships torn apart by someone spreading negative ideas and information about a person. Pitting siblings against one another. Driving wedges between spouses. Creating dissention in the ranks at the workplace and planting seeds of doubt. It comes to us naturally. We get mad and we want to vent. We want to draw others to us and away from the offender. Have you ever been offended by someone, had a misunderstanding of sorts? Then in a socially weak moment just rant on about what that person did, forever singeing this negative information in the minds of your hearers. Never mind that you got over it a week later. The gossip lives on. Like trying to put feathers back on a plucked chicken on a windy day, so you will never be able to fix the far reaches of damaging words. I like to think that most people are very smart and will say to themselves, “You know, that does sound pretty bad. But despite this unfortunate news, I’m not going to let it jade my opinions about the other.” But many are not. It is here that we would all be better off to just speak openly with the person we have an issue with, not talk to everybody else about them. Answer this: Do you think a person would be more upset if you came to speak to them about the problem directly or if they found out that you spoke to everybody else about it? When a friend comes to you with damaging news about someone. Take it as they are looking for advice on how to handle it. Or that they just need to take a load off. Then let it stop with you. Say that you will pray about this. Handle it vertically with God. Not horizontally by telling more people about it. I have been reading Laura Ingalls Wilder’s books to my kids. Laura quotes her mothers wisdom…“Least said soonest mended”. A testament to Proverbs 26:20. Even truthful words can be damaging so choose wisely where and when you use them. Here’s another great Caroline Ingalls quote. So we watch what we say and to whom. We encourage our kids to think the best of one another. We use our words to unite, not cause division. As women, sisters, mothers, grandmothers and aunts we have such an incredible influence. We are in such a prime situation to bring our families together. Yet many times we do the opposite. We don’t think the best about others, we assume the worst. Without addressing the issue directly we assume they meant to hurt. Women ALL OF US struggle with this issue so much. It is here in this dark underworld of gossip that we need to be women who shine the light of understanding. Who walk away from that juicy morsel knowing that it is laced with heartache. Lets love one another they way our Savior does. Let’s do our best to put others in the best light. Assignment: When is the last time you gave a grown woman a compliment. A sincere complement. Do this. Tell her what you notice about her and how great it is. Watch her. She may look down bashfully. That’s only because it’s been a while since someone noticed her. She may brighten…and the whole room will brighten with her! God bless you ladies! I will see you tomorrow night (Mon. the 24th) at Alicia’s house! Well talk about difficulties following our husband’s leadership. Like the sheep from Luke 15 that we read about on Tuesday, I went astray. I went out searching for something that I thought my Shepherd was withholding from me. Have you ever been stubborn like that? “If you won’t give it to me then I will just get I myself.” After Jeff and I were married we struggled to get it together spiritually. I tried so hard to reach out to Jeff but he was cold and distant. Since we weren’t going to church my “well” was beginning to run dry. Soon I had wondered so far from the Lord that I contemplated having an affair as an escape from my lonely marriage. I even read the book The Bridges of Madison County by Robert James Waller. You may have seen the movie. The whole story starts with these two adult kids going through their mother’s things after she had passed away. They stumble upon a journal and are shocked to learn that their mother had a passionate weeklong affair when they were school kids. The whole message of the book was that if you are so unhappy it’s ok to betray your husband. Keep it a secret. No one finds out. No one gets hurt. And I really fell for it. I believed that I could have this affair and it would be as a precious jewel that would I stash away in my jewelry box. Only I know it’s there and I can go and look at it whenever I wanted. The memories would be a hidden treasure that I would secretly cherish. It would be my companion on lonely days. So off I went. Even now I imagine my Shepherd watching me from afar, His wondering sheep. The reality of the affair was not at all like the fairy tale I kept trying to make happen. It was awkward. So many lies. Not satisfying. I knew I had made a huge mistake. I ended the two month long affair and I was so scared and lost and all alone. My heart bleated for The Shepherd. He found me. And I was ashamed to find that He never took His eyes off me. My repentant heart grieved over betraying my husband’s trust and I agreed with God that I was so wrong. I did not feel worthy of His help. It was my mess. But it is impossible to stand in such strong waves of grace and mercy. I felt so stupid and also very aware. It was like I could see clearly now. I thought back to the book I read and I was furious with the lie it was propagating. There was no precious jewel of memories to treasure in my heart. Only a deep stabbing pain every time I looked in my husband’s eyes. How could Francesca live with her husband while harboring such a secret? I’m guessing she didn’t live much. There is no life apart from Christ and we will never feel free if we are held hostage by such damaging secrets. Jeff was not perfect but his love was true. We struggled to meet eye-to-eye and heart-to-heart but it was pure and right. He would look in my eyes and tell me he loved me. “Not if you knew what I did”, my heart whispered. It was time to take the power away from this secret shame. We know that the truth will set us free and I would not spend the rest of my years living a lie with my husband, though I feared he wouldn’t be my husband much longer. How do you find the courage and confidence to confess such a scandalous betrayal? This is where the confidence comes from. When you live as a tortured prisoner and you see a way to escape, you take it. Even if it means you lose your right arm in the process. I might lose my husband, but at least I would be free. Free ladies! That was my courage and my confidence! I refused to let the shame rule over me. Not when Jesus stands bearing scars on behalf of my freedom! And oh the tears of relief. There is nothing like it. I did confess to Jeff and his parents. And to my family. He moved out for 5 months. Possibly friends thought I must be a wreck as I lived alone awaiting my fate. Quite the opposite. It was before I confessed that I was a wreck and lived with a dark cloud hanging over me. But now my heart was free and alive. I was no longer a prisoner. Do you know how good that freedom feels? It sustained me when Jeff left and it steadied me as he contemplated keeping me as his wife. I knew that no matter what, I would not be destroyed. I was reminded how precious my marriage is. On the verge of losing it forever I was making a commitment to cherish it always and not mistreat it. How is our marriage now? Stronger. And carefully protected like the precious jewel it is. From the Woman at the Well learn that only Jesus satisfies. From the Lost Sheep we learn how compassionate He is and how dependant we are. From Peter we learn that no matter how we have walked away from Jesus that He still has a place for us. And finally from The Woman Caught in Adultery we learn that when our sin threatens to separate us from the love of God, Jesus does not condemn us. Thank you friends so much for letting me invade your inbox this week! Praying for you all to respond to God when He reaches out for you. We’ll be in touch again before we meet on the 20th. Let’s call our John 21 scene, Peter’s Restoration. John 21 opens after Risen Jesus had sent his disciples to Galilee to wait for Him there. I wonder if Peter got impatient waiting for Jesus to show up. Maybe he thought, “I walked out on Jesus. I deserve to be a fisher of fish, not a fisher of men” So he took his friends and went fishing. The men are tired, hungry and defeated after an unsuccessful night of fishing. And this is when Jesus reveals himself to the men. I wonder what Jesus saw in Peter as he stared at the men from the shore. Well from what I read it seems Jesus was thinking, “I need this guy. But he feels unworthy of this calling.” In the gray early dawn the fishermen see a man on the shore who told them to try again on the other side of the net. You can just hear Peter muttering under his breath, “Hey buddy, ya don’t think we tried that! ?” Which is fine but that’s no ordinary man on the shore. So he let down the net anyway and …“When they did, they were unable to haul the net in because of the large number of fish.” (John 21:7) Immediately they knew it was Jesus. Peter jumps out of the boat to swim to shore. He cares nothing of the catch. This all seems so familiar and now Peter knows that Jesus hasn’t abandoned him. This whole scene is very reminiscent of Luke 5:1-11, when Jesus first called Peter to be his disciple. We’ll call this scene Peter’s Calling and read that here below. Then we will compare Peter’s Calling with Peter’s Restoration. Never underestimate God’s ability to set a scene. He is clearly showing off in this circumstance! Luke 5:1-11 One day as Jesus was standing by the Lake of Gennesaret (sea of Galilee), the people were crowding around him and listening to the word of God. 2 He saw at the water’s edge two boats, left there by the fishermen, who were washing their nets. 3 He got into one of the boats, the one belonging to Simon, and asked him to put out a little from shore. Then he sat down and taught the people from the boat. In both instances Jesus requests that the men throw their nets for a catch against their professional judgment. In both instances there is a miraculous catch! Though I’m not sure what to make of the issue of nets breaking in Peter’s calling in Luke 5 and the opposite as noted in John 21:11 with no torn nets even with such a heavy catch. Perhaps the nets reflect 1)the brokenness (“Go away from me, Lord; I am a sinful man!”) that we see in Peter’s calling and 2)Peter being “held together” by Jesus as he is restored. Hmmm. A girl can wonder. “…by the third time Jesus asks whether he loves him, Peter is hurt, that is, deeply grieved (elypethe). Jesus’ asking three times recalls the three denials, and Peter’s pride is cut to the quick. Here we see the Great Physician performing painful but necessary surgery. The light is shining in the darkness of Peter’s heart, bringing life, the repentance that enables one to experience the Lord’s love and salvation. Without such brokenness we are full of self and unable to hear and receive the guidance of the Chief Shepherd.” Quoted from commentary resources on Bible Gate.com. 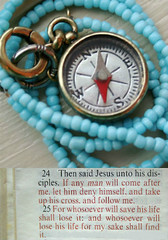 Retrieved May 31, 2012, from http://www.biblegateway.come/ resources/ivp-nt/Jesus-Forms-Peter-as-Leader-as-Disciple. The mission is clear in both scenes. Jesus wants Peter to leave fishing behind and be a part of the ministry. There are so many similarities with Peter’s call and Peter’s restoration. Jesus really is taking Peter back to the beginning! If only we could see what the Lord was doing when our lives take us to what seems to be familiar old ground. To a place we’ve been to before and thought we had mastered and moved on from. What is that old familiar ground for you? I guess mine would be “getting over myself” so that I can truly follow Jesus. I think that’s why I enjoy reading about Peter so much. Jesus needed Peter to not allow his past mistake keep him from the work that Jesus had for Him. I’ll post later today about our Friday devotional. Feel free to chime in on whatever God is showing you!